Mediterranean pasta salad is the perfect recipe for summer! This salad is bursting with delicious and nutritious ingredients, lots of veggies, and salty cheese. YUM. Comes together quickly and the whole family will be in love. Follow my tips below to make this delicious pasta salad recipe. 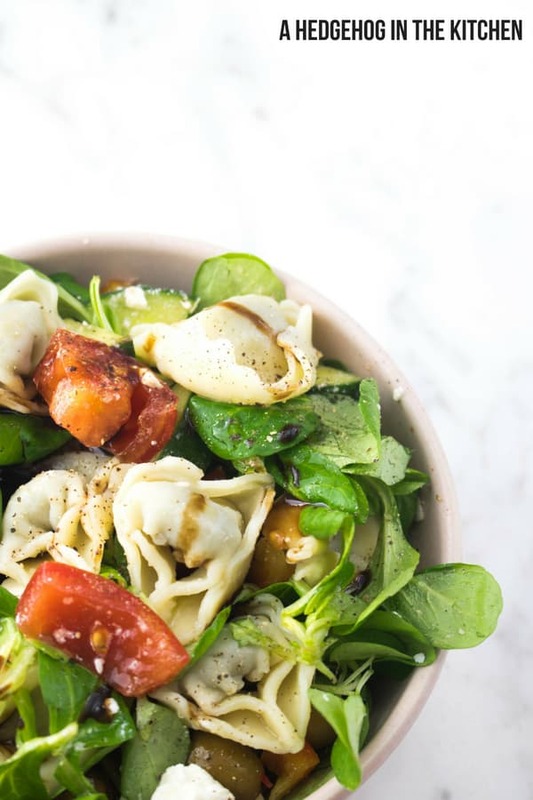 For this recipe you will need: Fresh spinach & ricotta tortellini, tomatoes. cucumber, green bell pepper, lettuce, green olives, feta cheese, olive oil, balsamic vinegar, salt and pepper. It’s Alix and Hugo from A Hedgehog in the Kitchen, back with you again to share a gourmet weeknight dinner. The weather has been absolutely beautiful in Paris recently. It makes us want to sit outside, eat loaded salads and sip on rosé. If you’re like us, and this dinner situation sounds good to you too, then you will love some more salad recipes. Our favorites include: mimolette and cheddar Summer salad, this French lentil salad and this heirloom yellow tomato mozzarella salad. 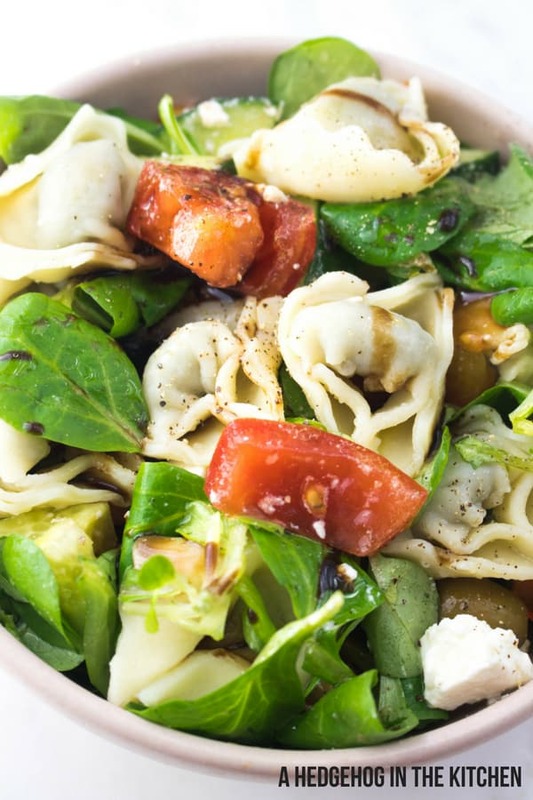 If you love fresh, crunchy vegetables, soft and salty feta, firm green olives and flavorful tortellini, then this is the salad for you. Adding the pasta to this salad, makes it more kid-friendly than a veggie-only option. Plus, it will keep you fuller longer. There is so much to love about this healthy recipe. Tons of veggies, check. Pasta and cheese, check. Quick and easy, check. Even the kids will love it. When cooking the tortellini, bring the water to a boil and add a dash of salt to the boiling water before adding the tortellini. Make sure you rinse the tortellini with cold water before adding it to the salad, otherwise, it will heat the other ingredients. Use a good quality coarse sea salt for maximum flavor. Different brands of feta cheese have varying levels of saltiness. Experiment with different kinds of feta to choose your favorite. If you’re excited about this Mediterranean recipe, you will love these 30 Mediterranean desserts as well. You’re sure to find the perfect dessert to follow your Mediterranean pasta salad. Cook the tortellini pasta according to the package. Drain and rinse with cold water and put aside. Cut the tomatoes, cucumbers, and peppers.. Put the lettuce in a large bowl. Put the tomatoes, cucumber slices, pepper cubes, olives, feta, tortellini, olive oil, balsamic vinegar in a bowl and mix. Top with salt and ground black pepper. Want more delicious salad recipes? Check these out! Enjoy your beautiful Mediterranean pasta salad creation. 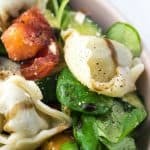 This pasta salad is filled with fresh tortellini, vegetables, feta cheese and topped off with olive oil and balsamic vinegar dressing. This quick, family friendly, veggie loaded, and vegetarian meal everyone will love. 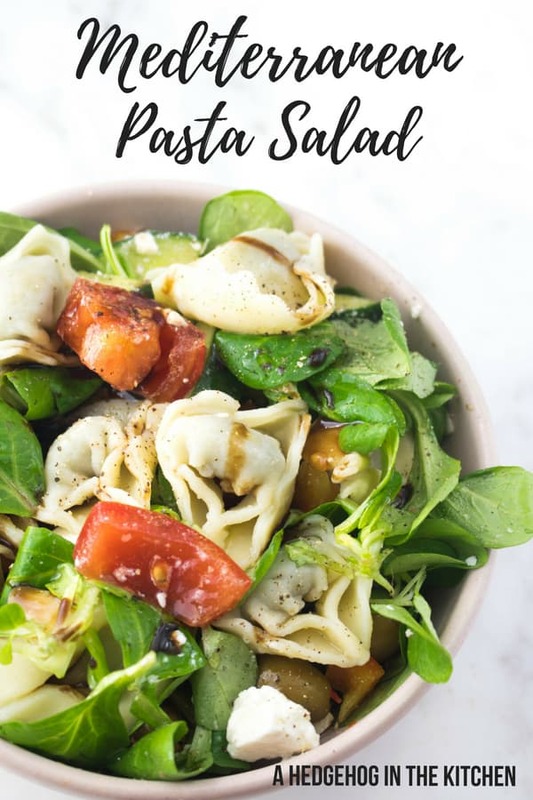 Mediterranean pasta salad is the perfect weeknight meal when you don’t have a lot of time, but still want to eat something healthy. Mediterranean pasta salad is the perfect recipe for Summer! This salad is bursting with delicious and nutritious ingredients. YUM. Coarse sea salt and ground black pepper to season. Cook the tortellini pasta as indicated on the package. Cut the tomatoes into 8 parts. Cut the cucumber in half (lengthwise) and slice finely. Cut the pepper into small cubes (à la brunoise in French). What is your favorite kind of pasta salad. I like the idea of adding tortellini. It gives me an incentive to eat a healthy salad like this.